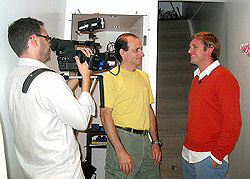 TV Appearance: Open House NYC - "Common Noise Problems"
Program Aired Sunday, October 21st, 2007, 8:30 am NBC4 New York. Alan Fierstein of Acoustilog, Inc. is featured, discussing common noise problems in New York City, including Hallway Noise,	Street Noise and Neighbor Noise. The sound testing is shown in extremely abbreviated form in order to fit the television program's time slot. The visit to the client's apartment actually lasted a couple of hours. In addition, please note that the contractors shown were there to provide a demonstration for TV purposes. They do not accompany our consultant on regular jobs.